Rwanda President Paul Kagame has once again promoted the Continental Free Trade Area (CFTA) as a pact that will guarantee the improvement of Africa's negotiating position globally. 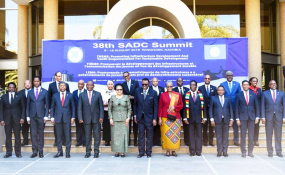 Speaking at the 38th summit of the Southern African Development Community (SADC) in Windhoek, Namibia, President Kagame, who is also the African Union chairman, said the AfCFTA and the Protocol of the Free Movement of Persons will also increase trade among African nations. "Domestic priorities are of course important and can never be disregarded. Those needs are what brings us together in the first place. We must find a way of taking care of our home front while building our regional economic communities. We have the ability to do more for our countries individually, but even better, collectively. Today more than ever collaboration among African countries is not a choice," he said. The CFTA was signed by 44 African nations in March in Kigali. The deal was boosted heavily last month after South Africa put pen to paper. Rwanda is among only six nations that have completed the ratification of the CFTA, out of the 45 nations that signed the agreement. The others are Kenya, Niger, Ghana, Chad and Swaziland. The CFTA must be ratified by at least 22 countries to come into force. Africa boasts a market of 1.2 billion people and a combined GDP of more than $3.4 trillion.